Syria has been bombed which calls for a deep analysis of what’s going on here. As we explain in our book Splitting Pennies – what really backs the US Dollar is BOMBS. Wall Street and the MIC (Military Industrial Complex) are inextricably intertwined, whether you are an armchair intellectual or an investor it’s important to understand this economic relationship. The latest action in Syria is that policy in action. Let’s take a step back and understand this critical but boringly predictable development in Syria, the players involved, their respective relevant histories, and what markets can expect. First let’s look at War Inc. or the Military as a business, or as we have outlined in a detailed article “Cult of War” (a good primer read if you’re not up on this topic). With 800 Billion + per year and a likely real spend of well over a Trillion USD, the US taxpayer needs to get something for their money. The Military is in a constant state of self-justification. The US outspends the enemy by such a large figure, there are stockpiles of bombs, planes, tanks, guns, logistic supplies, boats, aircraft carriers, satellites, and just millions of expensive assets getting dusty. The US could fight World War 2 on 2 fronts and a war in Space and still have assets left over. There are hundreds of military bases, millions of personnel, it has become just a massive super entity above Presidents, above the Elite, above Governments. By itself, as a form of Artificial Intelligence, the Military will do anything to prove the need it serves and survive. The glaring problem – no enemies! The number of real enemies is dwindling. But Syria has been on the CIA’s hit list for some time, controlling key Oil transport sites and other resources. Not to mention Israel has wanted to destroy the unfriendly regime for a long time. Cult of War needs to create conflicts of any size, it’s a ‘use it or lose it’ mentality. There’s no better training drill than the real thing. False Flag operations are nothing new, Hitler burned down the government building and claimed to be able to catch the terrorists and restore order in Germany, finally naming himself Chancellor. Every powerful regime has a False Flag that they ‘own’ in order to justify their 10 year run in power. Their time is limited, people forget, so a new event is necessary every few years, custom tailored to the situation. Speaking with EuroNews, Russia’s ambassador to the EU, Vladimir Chizov, said “Russian military specialists have visited this region, walked on those streets, entered those houses, talked to local doctors and visited the only functioning hospital in Douma, including its basement where reportedly the mountains of corpses pile up. There was not a single corpse and even not a single person who came in for treatment after the attack.””But we’ve seen them on the video!” responds EuroNews correspondent Andrei Beketov.”There was no chemical attack in Douma, pure and simple,” responds Chizov. “We’ve seen another staged event. There are personnel, specifically trained – and you can guess by whom – amongst the so-called White Helmets, who were already caught in the act with staged videos.” “All these facts show… that no chemical weapons were used in the town of Douma, as it was claimed by the White Helmets.” “All the accusations brought by the White Helmets, as well as their photos… allegedly showing the victims of the chemical attack, are nothing more than a yet another piece of fake news and an attempt to disrupt the ceasefire,” said the Russian Reconciliation Center. Of course, US warmongers will say that the Russians are protecting the Assad regime. There’s plenty of video and other evidence for internet sleuths to sort through in the coming days. But we have seen this so many times before we can guess the outcome fairly easily. It was a false flag, done by the British, in a sad and pathetic last attempt to save what remaining Elite aristocrats have over the masses, post Brexit. Although actual war is unavoidable in Syria now, one possible outcome of this is a populist movement against such politics, as is happening in Hungary. So what’s the real reason the US chooses Syria to bomb and not Greenland for example? It’s not only about Syria itself, you see. The GDP of Syria won’t make a difference on the USD. It’s about stopping a revolution. If Syria uses a Russian – Chinese financial and energy system perhaps it will spread to Jordan, Lebanon, and who next? If half the world is suddenly using a Yuan denominated trading market, it would threaten US hegemony. So all alternatives need to be stopped in their tracks, period. That isn’t an opinion it is the policy in DC based on research by companies like RAND. This is the beginning of a series of events that Trump cannot dig himself out of. The MIC won’t stop until the majority of Syria is destroyed and key resources are controlled by US forces. Some of us remember in the 90s there was ‘chatter’ that the NeoCons were planning a false flag in a major US City that was ‘nuclear’ – whether that was 911 or an event that never happened we’ll never know. But one thing is clear – they have the weapons, so they will kill all that stand in their way. Whether he is one of theirs or is being manipulated by them is irrelevant for his base which was largely anti-establishment and anti-war, anti-globalist, which he has proven to be the opposite. With the ascent of Russia, China, and smaller states building their armed forces without reason, it is only inevitable that they are used. War between China, Russia, the US and allies is inevitable. But wait – it’s not what you are thinking! There will not likely be strikes on US, Chinese, or Russian soil. Rather, as in the Hunger Games, war games will be played in theaters such as the South China Sea, Syria, and other hotspots. China and Russia are both copying the War Inc. model from the United States. Both countries do not have any real threats (except from the United States, but as a game) with the exception of terrorism. Japan has no army and is not a threat to China. China has destroyed all the regional competitors and has no real major state enemy. Domestic politics may be a bigger threat to China than any foreign military (as China was once a chaotic, multi-state region). China is a little bit like the Soviet Union, but through the prism of their culture of course. The point is multi-ethnic super states usually collapse given enough time, as there are competing domestic interests at play. That is China’s focus not to be a military power, their external show of force is to play the American game. America needs an enemy. The China ‘copy and paste’ model, a threat to the IP of US tech companies, is also at play with War Inc.
Russia is an interesting case here. During the Soviet Union Russia was a defense oriented country that did little in foreign countries outside of the Iron Curtain. After decades of high quality propaganda, at a cost of tens of billions of dollars, Russia realized that if they wanted to be a major player in the world and participate in the new growing economic power center they needed to switch to Capitalism, which they did in 1991. This was a hard shift, it is difficult for those outside Communist countries to understand what it means to ‘switch’ from a state controlled economy to ‘free market’ economy. Russia’s markets were so free in the 90s it led to massive growth by organized crime which was borderline legit business (they were like the Robber Baron’s of the industrial age in USA). Basically Russia is 80 years behind the US, socially. Since 1991 Russia has taken all the advice given to them by their Western economic advisers. They have implemented a stock market, there are entrepreneurs in Russia starting businesses on a daily basis, they even have a Silicon Valley style incubator in Moscow Skolkovo (and others – see more info on starting a venture in Russia here). Russia has implemented many reforms in their plan to make Russia a market leader. They have a long way to go, their manufacturing standards have become a joke when Putin opened the door of a Russian car and the handle came off. But the world seems to forget that this was the ‘Communist’ country that the West sold on a better, capitalist life. One of the trimmings of a Capitalist society is War Inc. The partnership between Syria and Russia is a natural one; there are critical oil pipeline routes in Syria and Syria is a Christian foothold in a predominantly Muslim region. Russia didn’t invent the War Inc. model however it is now operating it based on a business plan that was sent to them by Washington during the Cold War. It should come as no surprise that they are doing what they were convinced to do by Capitalist Generals in Washington. Billions upon billions were spent on Hollywood produced propaganda programs including films, radio (Air America), Television programs, news, and later internet campaigns. They are influenced by reports such as “What the bombing of Syria means for your 401k” and other reports. Russia is playing the role of War Inc. – a model copied directly from US interventions in Iraq and other places (Iraq is most similar). There is no real skin in the game for either country, Syria is just a proxy state to be used and abused for the war profiteers. This is the first time Russia is playing this role and it is playing it well. It wouldn’t be surprising if Russian and US generals were exchanging encrypted communications on their competing computer game theory simulations while contemplating their next moves with each others open feedback. Why are vacuum cleaning manufacturers honest and politicians are not? Because when you buy a vacuum, you immediately see how it works (the dirt and particles are caught in the transparent tank). If a vacuum didn’t work or had poor suction it would be immediately apparent and people would return them or complain. Politicians control the information flow, especially during war, because they have power. This is especially true of government employees who are publicly elected. In private business there is a lot of oversight and ultimately you will fail or succeed, you can’t lie to investors quarter after quarter. Finally, there is this class in America not sure how to describe them, perhaps “Saturday Night War Experts” – they support any show of US force. They are mostly middle aged males with health issues, mostly on multiple prescriptions, they enjoy watching infographics explaining the differences between cruise missiles and smart bombs, right after their 5th glass of Merlot. This class isn’t completely handicapped, but they choose to spend their free time sitting in Lazyboy chairs watching Fox News and other sources during wartime. When they’re not tuned in, they enjoy to debate with their friends different methods how the US could use its arsenal to completely destroy Syria or “Make it GLASS” as I’m sure all readers have heard someone say once. This grotesque hobby is what gives those in DC power to enact such measures. You don’t read headlines that Norway has unilaterally destroyed Sweden. In New Zealand for example there is a ban on Nuclear anything. During the last Iraq was there was an interesting correlation between US strikes, war actions and info, and the US Dollar. It was caused by speculators not real money flows. War is information and the markets live on information. All markets will be impacted by this war, it can even be a trading strategy by itself. Defense stocks will have a boost on successful missions. Key victories will lead to USD being bid up. It’s a busy time and there’s a lot happening. War traders must be tuned in 24/7 as the smallest bit of info that hasn’t hit the wires yet can cause markets to move. Traders need to become information junkies. Don’t skip over the obvious facts that are staring us in the face. 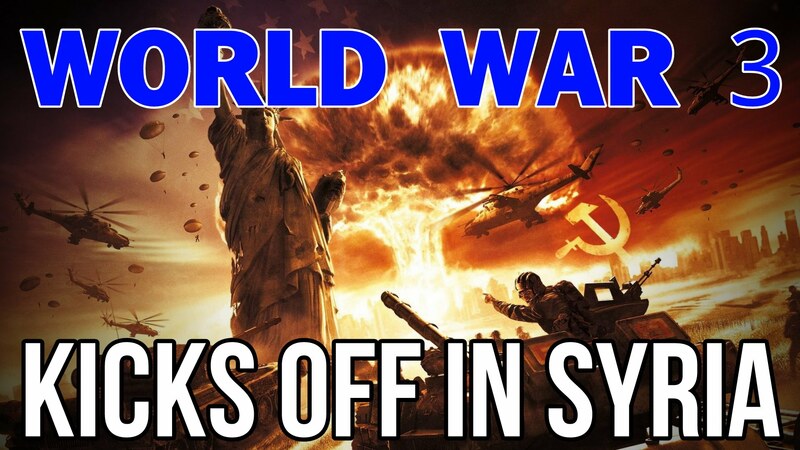 This is the beginning of World War 3 – but don’t worry – it’s good for the economy. Game on!